It is a suggestion to use magnetic method to evaluate life of supporting construction of steel. Special equipment for this method is recommended here. Mechanism of appearance and accumulation of flaws is explained here in connection with behavior of respond of coercive force HC. The results are presented on example of testing and research of oxygen tank. It is a very important problem to evaluate possible life of supporting steel constructions, especially in countries, having more than 50% of the devices of high danger ( cranes, lifting machines, tanks, boilers etc. ), which have already worked out their life, as a way to increase their exploitation period. Substantial part of task of constructions state evaluation can be solved now by help of magnetic method of coercive force measuring and introducing of load registration system "SIRENA". Norms basis for the magnetic method of testing of ferromagnetic steel constructions are written in Interstate standard GOST 30415-96, International standard ISO 4301 and Methodical appointments of "GOSGORTECHNADZOR" of Russia RD IKC "Kran" - 007 -97. Equipment providing for this method is special magnetic structuroscop KRM-CK, developed by company "SNR" (Charkov) and MSIA "Spectrum" (Moscow). Depth of magnetization is up to 40mm. For testing pipes and tanks it is considered to use pole terminals appropriated to their profiles. When it is demanded to reject metals by their mechanical properties and a state of its structure, the device has digital, light and sound alarm signaling for low and high level of magnitudes HC. The device KRM-CK-2M has opportunity to connect with PC. A base of magnetic diagnosing method is correlation between mechanical properties of ferromagnetic materials and coercive force magnitude HC, measured during static and fatigue tests for all stages of loading right up to destroying. Based on energy approach to analysis of metal magnetization, theoretical investigations of elastic plastic deformation, rising of defects quantity and increasing of coercive force magnitude HC allow to reproduce the process of metal samples loading in exploitation under conditions of state of complex stress. In combination with tested samples the method of similarity allows to determine main parameters for evaluation of state of metal constructions by measured magnitudes of coercive force, appropriate: to limit of fluidity - HCT , to limit of durability - HCB, to limit of endurance - HCN, - with taking in account an anisotropy of mechanical properties of steels and alloys. Fig.1 shows dependencies between coercive force HC (A/cm) and acting stresses s (kg/mm2), when flat samples of steels St3, St20, 09G2S are tested staticly. As samples of thickness 5...10mm are permanently strained in the elasticity zone of curve of loading, so the coercive force HC rises proportionally in dependence of applied tension right up to limit of fluidity - sT. In the zone of loading curve, in which metal durability is coming down, irrevocable reconstruction of domain structure of metal begins because of domains boundaries turning 900 and 1800 more. Thus the small plato appears on the curve of dependence HC(s ), and its name is "tooth of fluidity". In the zone of loading curve, in which load goes up under irrevocable deformations, coercive force HC rises up simultaneously with new domain structure appearance and active flaws accumulation in the metal. On the stage before the metal destruction the increasing of durability stimulates final reconstruction of domain structure, increasing coercive force HC up to maximum accordingly to steel sort and is accompanied by appearance of frail microcracks in areas of boundaries and joints of domain grains. After appearance and opening of main crack, stresses in the area of crack development fall slightly down, and coercive force HC falls down too. Maximum of HCB corresponds to durability limit of metal sB. Under stepped loading and, if HC is measured after load taken out of the sample, the magnetic parameter responds only to the remaining stresses and deformations inside the metal, in the zone of elasticity HC is constant and equal to the initial magnitude Hc0, but after achievement of the limit of fluidity it rises up in accordance with linear dependence. In this case the energy, wasted out for metal destruction and maximums of HCB in that two cases are approximately equal (the same). Fig 1: Data of magnetic test of flat samples of steel St3,St20,09G2S in experiment of strain with registration of data of coercive force meter right under load and after load is taken out on every stage of loading. Fig 2: Magnetic test of steel Vst3sp5 sheets resistence to destruction of few cycles fatigue. Energy approach can be certainly used to analyze fatigue destruction of metal. Fig.2 presents results of cyclical loading of flat samples of steel VStZsp5. Tests were carried out in "from zero" cycle with amplitude providing for easy, normal and hard regime of working of metal constructions of elevating machines in accordance with standard ISO 4301. It means that metal was tested by static strain in the beginning of elasticity zone of loading curve (s< s0,2) - easy regime, then in the zone of elastic plastic deformations under stresses s £ s0,2 - normal regime, and then under s> s0,2 - hard regime of loading. To evaluate common state of metal constructions of elevating equipment, when it is tested and technically diagnosed, it is enough to carry out analysis of distribution of magnitude HC(A/m). It needs to find really high loaded elements (HCMAX) and to compare their values of HC with HC0, HCT, HCB, appropriated to limits of fluidity and durability of steel sort, which the supporting elements are made of. So the decision about life resource of elevating equipment can be made by comparison an average magnitudes HC and maximums HCMAX of coercive force with fatigue diagrams for appropriate loading regime and steel sort. Common approach to diagnosing of strained deformed state and life resource of objects of high danger by magnetic method under real conditions can be considered on example of oxygen tank. Internal stresses in the wall of oxygen tanks could be easily computed, if internal pressure and wall thickness are known. So the experiment of tank loading by pressure of water inside up to destroying allows to link directly the level of maximal acting stresses sMAX with magnitudes of coercive force HC and to determine dependence, as it is presented on fig.3. Fig 3: Magnetic test of strained state of oxygen vessels pressure Pvn upto destruction. That dependence basically corresponds to classical diagram s(e) for straining of steel samples. On that curve it could be pointed out the zone of elasticity (I), zone of elastic plastic deformations (II), stage of fastening with following destruction (III). Slopes on that curve can be identified with values s T and s B for that metal, which the oxygen tank was made of, with using of computed value of stress maximum s MAX(PVN) of internal surface of tank wall. Error of determination of mechanical properties is less than 10%. Fig 4: Static analysis of coercive force Hc distribution in walls of vessels,been working more than 30 years and let into elploitation after technical certification. Thus for every steel it is easy to find HC0, HCT, HCB from experimental diagrams of loading of laboratory samples and samples of oxygen tank, corresponding to different stages of loading of tank wall metal. In practice, when contrary task must be solved, not only the maximum stresses inside metal of tank wall can be determined by using maximum and medium magnitudes of coercive force, but the moment of metal transition into the fluidity zone, and thus it would allow to avoid an exploitation of oxygen tank at the stage near destruction. The same results can be reached by the analysis of coercive force HC, rising in process of cyclical loading of tank as, as critical data HCT and HCB are constant for every steel. 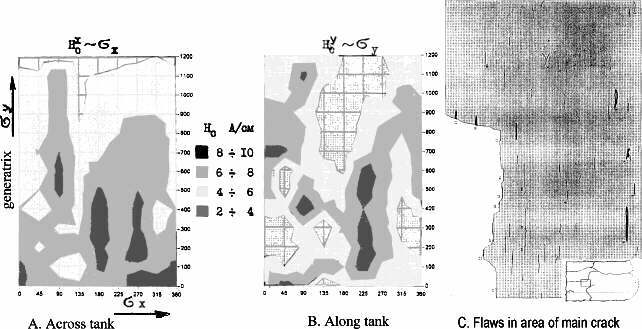 Analysis of HC distribution for internal and external surface of tank been exploded by filling of oxygen under pressure of 15 MPa (PVN=150atm) confirms scientific and technical reliability of magnetic method. Diagrams of distribution of coercive force along and across on surface of the tank in zones with different data of HC are presented on fig.4a, 4b. As data appear on internal and outside surfaces of tank wall approximately the same, so the tests were carried out mainly on the outside surface. Black zones with HC>> HCT differed by critical size of fatigue elliptic cracks been found on internal surface, where the crack of exploding tank began to appear from, fig.4c. Test, carried out in accordance with DNAOP 0.00-1.07-94 two weeks before explosion, shows not critical state of metal of oxygen tank, made of steel Ds, and can not evaluate its real resource of life. If magnetic test would be carried out enough earlier, the explosion could be avoided. Statistic analysis of HC distribution inside walls of 800 oxygen tanks, working more than 30 years, allows to determine criteria of rejecting of tanks and to find more than 2,5% of the tanks, working in critical regime of exploitation, which were needed to take them out of exploitation, fig.5. Fig 5: Diagram of flaws and coercive force distribution on suface of wall. V.F. Muzhitsky, B.E.Popov, G.Y.Bezludko, V.V. Zarudniy, E.A. Levin, Defectoscopiya, 1996, N 3, p.12-19. L.A.Krutikova, V.F.Muzhitsky, B.E.Popov, G.Y.Bezludko. Book of abstracts 7-th European Conference on non-destructive testing. Copenhagen, May 1998, p.351. GOST 30415-96. Interstate standard (Russia, Ukraine, Kazachstan, Belorussia) "Steel. Non-destructive testing of mechanical properties and microstructure of metal cast by magnitic flow." B.E. Popov, G.Y. Bezludko, V.F. Muzhitsky. Thesises of reports of 15-th Russian science technical conference "NK and diagnostic". Moscow. July, 1999. p.392. G.Y. Bezludko, V.F. Muzhitsky, B.E. Popov. Factory laboratory. 1999, N9, p.53-57. V.G. Kuleev, E.S. Gorkunov. Defectoscopiya, 1997, N11, c. 3-18. S.Takahashi, J.Echigoya, Z.Motoki. Jornal of Applied Physics. V 87. N 2. 2000. Z.J. Chen, D.C.Jiles, J.Kameda. J. Appl. Phys. 75, 6975. 1994. V.A. Glushkov. "Sopromat." Ìoscow. "Ìetallurgy", 1965, p.538-542. G.Y. Bezludko, E.A. Levin, V.F. Muzhitsky, B.E. Popov. Thesises of reports of 15-th Russian science technical conference "NK and diagnostic". Moscow. July, 1999. p.407.